Republican House Speaker Paul Ryan vowed today to stop Donald Trump’s proposed temporary ban on Muslim immigration to the United States. Of course, Ryan has NEVER sued Barack Obama for any of his power grabs. 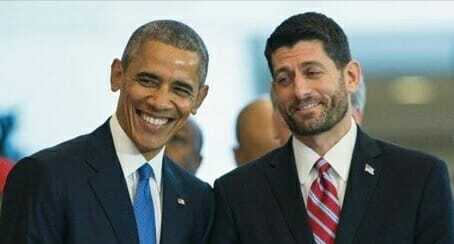 House Speaker Paul Ryan (R-WI) has made clear he doesn’t agree with a proposal put forward by Donald Trump — whom Ryan has endorsed — to ban Muslim immigration into the United States, but in an interview with the Huffington Post Thursday, Ryan floated taking a President Trump to court if he tried to implement such a ban or some of his other controversial proposals unilaterally. “I would sue any president that exceeds his or her powers,” Ryan said in a back-and-forth about Trump’s claims that he could implement a Muslim ban or build a Mexican border wall without congressional approval. Ryan said he wasn’t sure of the “legal question” of whether Trump could institute a Muslim ban on his own as president. “That’s a legal question that there’s a good debate about,” he said, citing the 1952 Immigration and Nationality Act. “On the broader question, are we going to exert our Article I powers and reclaim this Article I power no matter who the president is? Absolutely,” Ryan said. He also said he discussed the limits of the executive power with Trump. In the interview, Ryan said his endorsement of real estate mogul did not give Trump “a blank check,” and that he was still trying to achieve “real unity” between the presumptive nominee and his caucus.